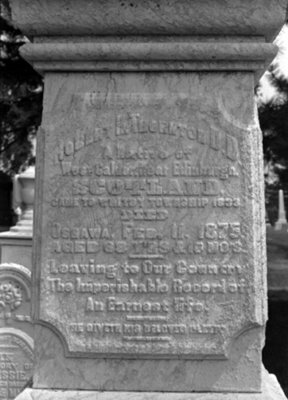 A black and white photograph of Reverend Robert Hill Thornton's gravestone. Reverend Dr. Robert Hill Thornton was born in April 1806 at Calder, near Edinburgh, Scotland and attended the University of St. Andrews and the Secessionist Church College in Glasgow, Scotland. In 1833 he received a call to become the first Presbyterian Minister in Whitby Township and established his church at Dundas Street and Kendalwood Road. In 1837 he moved to the site of the Union Cemetery where he built a brick church and a school. He established churches at Columbus, Pickering, Dunbarton and Claremont. He was Superintendent of Education in Whitby Township from the 1840's until his death. In 1861 he took over St. Andrew's congregation in Oshawa, where he died on February 11, 1875. Reverend Thornton is buried at Union Cemetery, Oshawa. Reverend Robert Hill Gravestone, Date Unknown, Brian Winter. Whitby Archives A2013_004_458B.